Pongal [Pon – gul, rhymes with sea-gull] is a classic one item meal most popular as a breakfast in South India. It would not be an overstatement to say that most South Indians would have eaten it at least once. Here I present what I consider a slightly offbeat variation of the commonly known recipe, the origin of which goes somewhat like this. I was in Dubai this May and as a frazzled mom of a toddler who was on a hunger strike for what seemed like days, I was all ears for any trick that showed the slightest chances of working. So, while sharing each other’s motherhood experiences, my co-sister ((India) one’s husband’s brother’s wife) suggested using okra in the traditional Pongal as one of the toddler pleasing food ideas. Okra in Pongal is not instantly intuitive, you think? I had heard it the first time too, but I was ready to give it a shot if my tiny one opened her mouth. I tried this recipe at the first chance I got to cook for her and lo and behold, she liked it and finished the plate too. I do not know if it was only to do with the Okra, but she ate and that’s what counts. If you have a trying toddler like mine you are most likely nodding by now. Go ahead and try and let me know if you got a seal of approval from yours. For those of you who have never eaten Pongal once or eaten the original one a gazillion times, whatever your excuse, it sure is worth a try. The recipe here is adapted for the serving size needs of a toddler and yields about 2 – 3 servings depending upon his/her appetite. Dry roast the rice and dal until rice turns opaque and dal turns light golden making sure not to burn them. 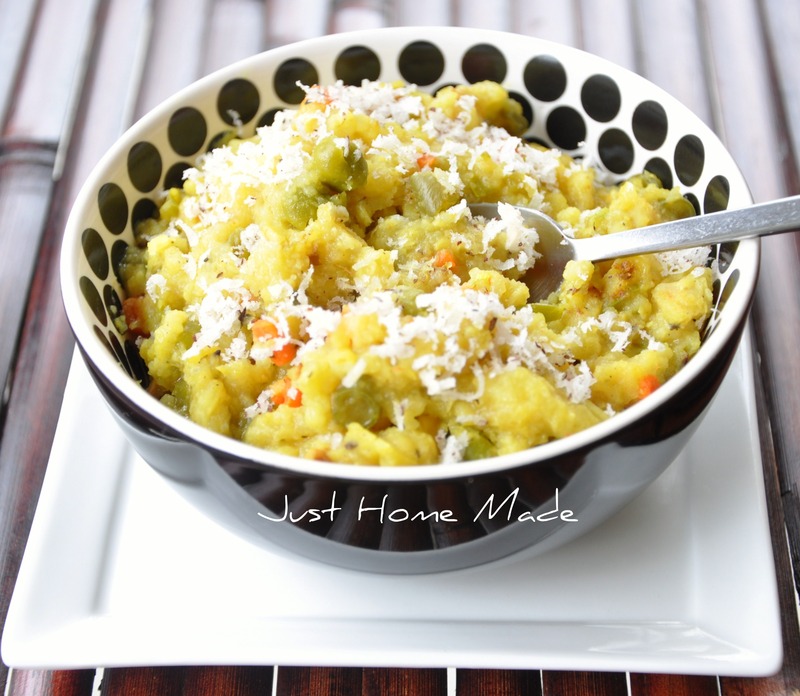 Alternatively, microwave the rice and dal for a 1 to 1- 1 /2 mins checking in between. 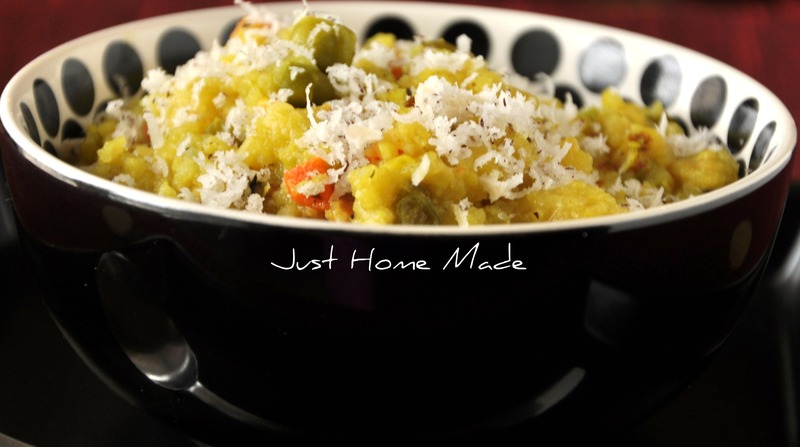 Optionally, a drizzle of ghee can be used for roasting the rice and dal mix. 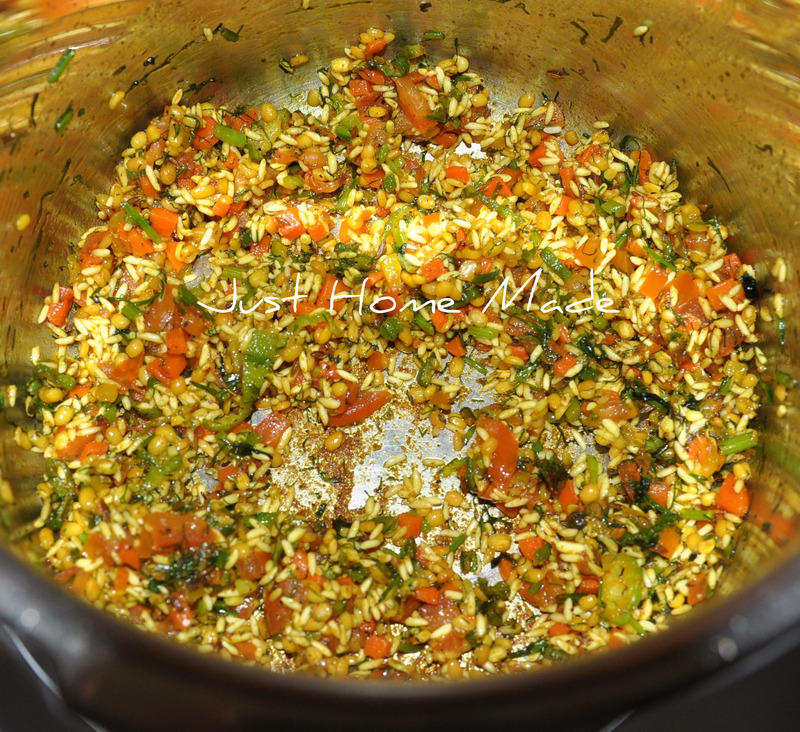 Heat ghee in a pressure cooker, when it is hot enough add the cumin seeds and let it crackle. Add in the cashews. When the cashews turn light golden, sauté the minced onions along with turmeric. When the onion turns translucent, add in the okra and sauté till the okra is no longer sticky. 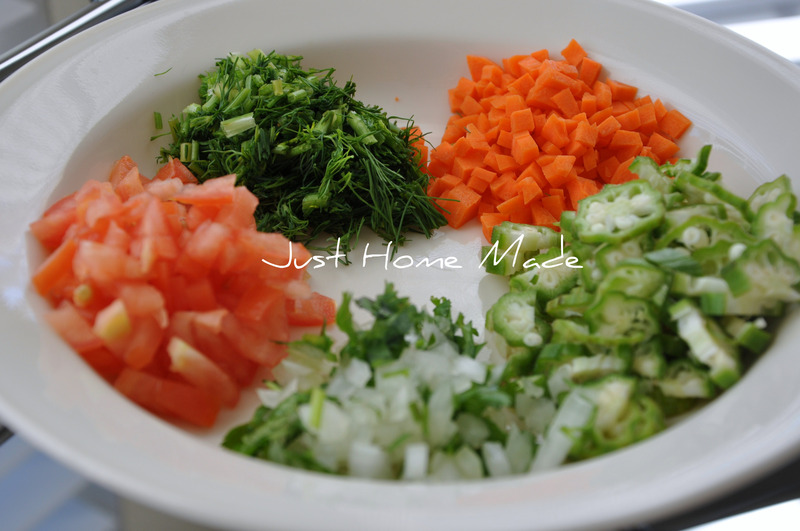 Add in the chopped carrots and dill weed and sauté for a few more minutes. Finally add in the chopped tomato, sauté and add ground pepper and salt to taste. To this, add the roasted rice and dal mix and stir for few more minutes till all the veggies stick well to the rice. Now add the water, cover and pressure cook until at least 3 whistles. When the cooker cools, serve with a drizzle of ghee. 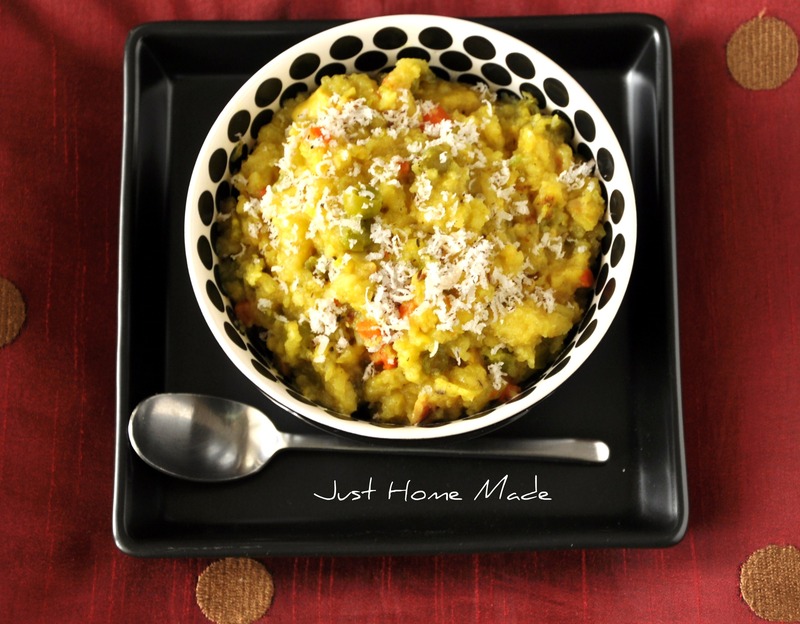 For more servings, increase the vegetable proportions and just add water 6 times that of rice & dal mix to yield a soft and porridge like Pongal. 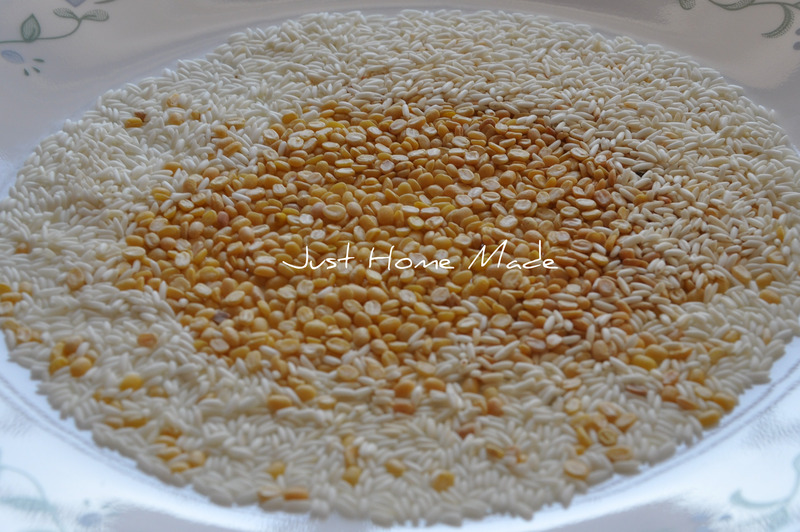 Example, for 1 cup of mix i.e, 1/2 and 1/2 cup of rice and yellow dal, add 6 cups of water. A small pressure cooker say of 2 or 3 liters is very handy to cook small quantities especially for “toddler only” food.